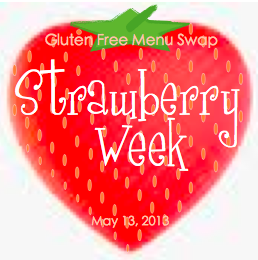 I am excited to host the Gluten Free Menu Swap this week. The theme is Strawberry. I am loving all the tasty berries that are showing up at the market right now! We like strawberries plain, sliced on pancakes or salads, and tossed into smoothies. Some other things we make with strawberries are Strawberry Julius, Strawberry Rhubarb Raspberry Crumble, Strawberry Buckwheat Muffins, Strawberry Rhubarb Bread, in our dairy free fruit on the bottom yogurt,Strawberry Rhubarb Salad Dressing, Strawberry Banana Smoothie, Strawberry-Rhubarb Smoothie, Red Berry Smoothie, Strawberry Drop Scones, Strawberry Banana Muffins, and in both the dairy free Strawberry Custard “Ice Cream” and the Strawberry Philadelphia-Style “Ice Cream.” How do you serve strawberries? Freezer cooking plan for the week: Stir Fry Chicken and Thai Chicken Burgers are making their way to my freezer this week. The week’s breakfast options: Freezer Smoothies with Veggies and Strawberry Banana Muffins, scrambled eggs with wilted greens and garlic, and various fruits. The week’s lunch options: Peanut butter and Banana Bread (make a double batch, one for the freezer) or ham on GF Oatmeal Bread sandwiches, and various fruits and veggie sticks. For the freezer: Make a double batch of Stir Fry Chicken. Serve one batch at dinner. Mix up the second and package in a freezer bag, removing as much air as possible, label and freeze. 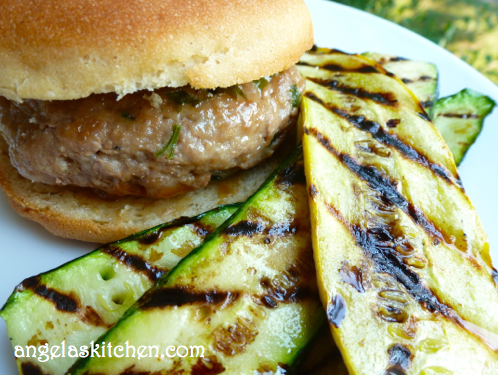 For the freezer: Make a double batch of Thai Chicken Burgers. Serve one batch at dinner. Freeze the remaining patties in a freezer bag separated by waxed paper. Remove as much air as possible, label and freeze. Heather of Celiac Family is jumping back into her smoothie routine with Banana Berry Smoothies. Yummy way to start your day and get more strawberries in your diet! For dinner this week she is serving Grilled Steaks with Roasted Potatoes and Spinach Salad topped with Sliced Strawberries and Poppyseed Dressing, Bacon-wrapped Chicken with Seven-Layer Salad with Creamy Dill Dressing, Grilled Hamburgers with Sweet Potato Fries and Berry Fruit Salad, Fish Tacos served with Red Cabbage slaw and Tropical Black Bean Salad, and Chicken with Patak’s Jalfrezi Curry Simmer Sauce and rice and green beans. Sounds delicious! Melissa from Mom’s Plans now making the full time transition to gluten free for her family, so is now going through the changes that entails. On the plus side for us, hopefully that means we get to see more of her wonderful menus for the Gluten Free Menu Swap! This week she is dishing up Mexican Chicken & Bean Soup, Taco Soup, Goulash, Spaghetti with The Best Tomato Sauce Ever, 4 Ingredient Beef, Potatoes, & Carrot Slow Cooker Meal, and French toast (with GF bread & rice milk) with eggs and sausage. So tasty! Kimberlee of The Peaceful Mom has a tasty menu of Ranch Chicken Casserole, Baked Potatoes with bacon, steamed broccoli and cheese, Burgers with Sweet Potato Fries, Hot Dogs and Baked Beans, and Chicken Enchiladas with rice and Tropical Fruit Salad. Thanks for sharing, Kim! Samantha of Awkward Girl Gets Fit is rocking out a yummy menu of Grilled Chicken with Grilled Squash Ribbons (skipping the prosciutto and probably basting with a vinaigrette instead of serving with a dipping sauce), something from the freezer grilled with Baked with Hancock Salad, Peppers and Zucchini in Foil (or maybe just stir fried, Carne Asada with Salad, and Paleo Swedish Pancakes with Berries and Sausage. Delicious! 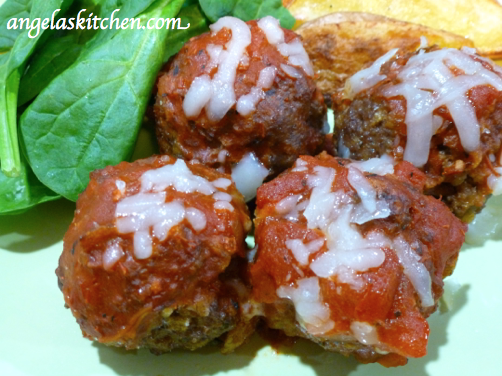 Erin from Little E’s Kitchen joins us this week with a paleo meal plan. They will be eating grilled shrimp and green beans, nitrate free hot dogs and cauliflower, sloppy joes on paleo bread. Yum!